What is FABO Academy X China? 什么是 FABO Academy X China? Fablab O Shanghai’s “Fabo X Academy China”, is a modular course about digital manufacturing and rapid prototyping. The course is based on MIT’s “How to Make (Almost) Anything” course and the Fab Academy global seminar. Fablab O has been iterating its Fabo X Academy for many years through experience teaching collaborations with schools and universities, cooperating with institutions implementing fab labs, its Fabo X Academy one week seminar, hosting digital fabrication competitions, and numerous symposiums. No Prerequisites! The Fabo Academy X program developed by Fablab O is hot enrollment. These courses are for everyone, such as high school and college students, entrepreneurs, STEAM teachers, technicians and designers; they can help high school and college students to prepare a high-quality portfolios to apply to the top overseas universities, or enable university graduates to bring their design works into hardware entrepreneurship stage; our organization can also provide high-paying jobs for the course graduates. Do you want to apply for an university abroad? A wonderful Portfolio is needed except for higher English scores. Take two high school students for examples, Yihang Xu and Zeping Lu, Fablab core members with professional skills and innovative thinking, they learned from the FABO X curriculum, both have already obtained their favorite University Offers. Gordon – Xu Yihang was admitted to the University of Rochester, one of the members of the World University League, studying to dual degrees in Electronics and Computer Engineering and Economics. Zeping Lu entered the University of Illinois, known as the “Public Ivy”, proceed to the degree of electrical engineering and biology. Lu’s assist experience of Biobuildlab establishment in Fablab O added color to his further study in the United States! The germ of fab labs started as a collaborative platform for exploring how the content of information relates to its physical representation. Leveraged by an open-source, share everything ethos, fab labs have quickly spread throughout the world. As of December 2018, there total 2500+ official fab labs, worldwide. A fab lab (fabrication laboratory) is a small-scale workshop offering (personal) digital fabrication. A fab lab is typically equipped with an array of flexible computer-controlled tools that cover several different length scales and various materials, with the aim to make “almost anything”. Recognizing the unique challenges within China and the profound advantages of open-source collaboration, Fablab O, China’s first fab lab, has established a platform to install and manage new fab labs and a modular curriculum of STEAM related contents. 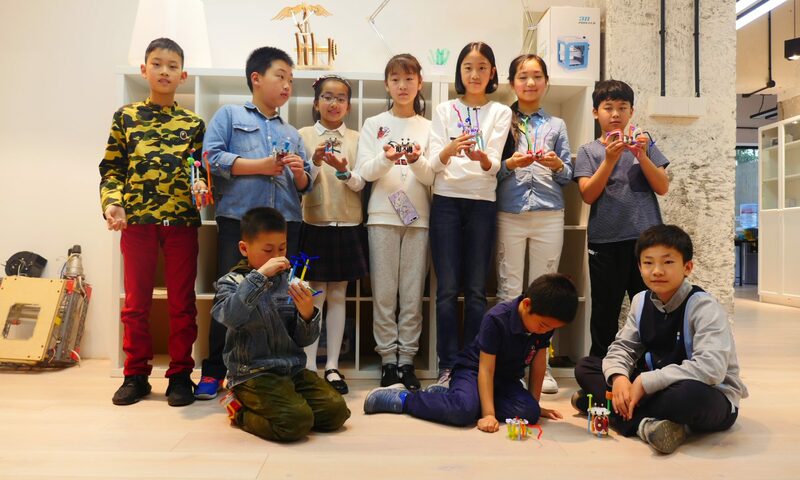 Fablab O is raising a regional collaborative network of fab labs in China in which every school or institution with a fab lab will be connected, receive educational content from the global and regional network, and in turn share their local discoveries and content creation. In October 2017, Fablab O organized the STEAM Education Symposium, hosted at Tongji University’s College of Design & Innovation, to spread and promote innovation in the traditional education system. Throughout three intensive days, the event held a number of lectures, workshops and demonstrations helping hundreds of Chinese educators to deepen their understanding of how fab labs are helping their peers understand and implement STEAM education worldwide. Further, Fablab O fielded countless questions and challenges from the participating educators in regards to their experience with STEAM education. The FABO X Academy Winter Bootcamp has been formulated in direct response to these inquiries. FABO Academy X is the little brother of Fab Academy. It is a shorter course teaching you the fundamentals of digital manufacturing. FABO Academy X is based on Fab Academy global class and can be your stepping stone to continue in the full Fab Academy course. If you have completed Fablab O’s FABO Academy X and choose to take the Global Fab Academy course, the tuition fee for FABO Academy X will be deducted from the Fab Academy tuition fee. TongjiUniversity School of Design and Innovation, associate professor; DeputyDirector of Environmental Design; Founder of FAB O Shanghai and FAB OPlayground；He graduated from Southeast University Department of Architecture, and earneda dual master’s degree in Architecture Design from Harvard University and Universityof Iowa. Atelier-iform Creative Design Director. He founded the Fablab O brandin 2013.Since 2013, he has been the Fablab O director in the School of Designand Innovation at Tongji University. Fablab O｜Course Director of FABO Shanghai, Researchassistant in the School of Design and Innovation at Tongji University. Graduated from Fab Academy 2015;He was an architect, product designer anddigital manufacturing expert. Served as Fablab Lab Course Director in Paris,France, and Project manager of MakerFaire in Rome, Italy. Fablab O｜Course Director of FABO Shanghai, Researchassistant in the School of Design and Innovation at Tongji University. J.travis holds a Master degree in Architecture from UCLA and a Fab Diploma ofthe 2017 Fab Academy. Further, he is a researcher at Tongji University of Shanghai, developing STEAM education and outreach in a number schools anduniversities throughout Eastern China. DìshūBot, a self-learning robot that paints Chinese calligraphyin water (featured in the 2017 Bay Area Maker Faire) and Pure Imagination,plant fed microbial fuel cells that will power our homes and much more.